3 bdrm "Blue Lake" cabin - Pinetop - skiing- WiFi - FREE Night Promotions!! 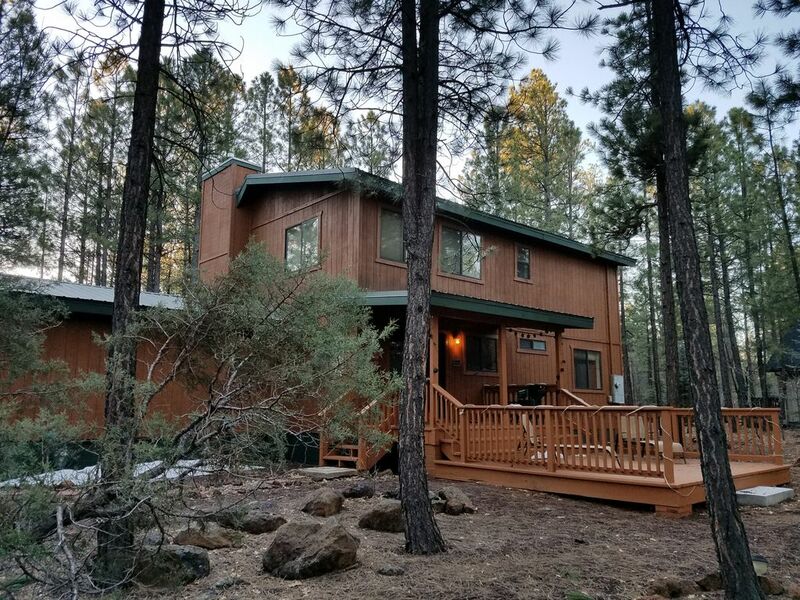 Come stay in our beautiful 3 bedroom cabin on an amazing large lot in the Pinetop Country Club! Located on a huge lot full of tall Ponderosa pine trees and only 5 minutes to the Pinetop Country Club offering golf, swimming, and horseback riding. Only 10 minutes away is the Hon-Dah casino and less than a 30-minute drive to the Sunrise Ski Resort and amazing mountain lakes with some of the best trout fishing in the country! You will absolutely love this extremely peaceful and lovely cabin. HOLIDAY BOOKINGS are a min of 3 nights. For more information on our Free Night Promotions please google Cool Mountain Vacations. This cabin is nestled in the heart of the Pinetop Country club. it has a very large front and back yard for children to play in as well as it comes with bikes, helmets, sleds and other fun outside things to do. It is also close enough to local restaurants and 25 minutes or so to Sunrise Ski resort where there is a slope for every level of skier, boarder or sleder in your group or family. Booking was easy, directions and property details were all easy to follow. We could never get the fireplace to work (which would have been nice) in the snow. Overall great place to visit. The house is warm, and cozy and beautiful. The fireplace is awesome, the rooms simple and practical. Lots of space to spend family time. Bring extra blankets, and towels, and also pillows if there will be people sleeping on the matresses on the floor. There is a super useful grill, and the garage is very helpful as well. The only thing i can think of to improve is the order and neatness of the kitchen, and it could also be better equiped (more and better, or perhaps newer). We really enjoyed our stay. Thanks! complete satisfaction.....I strongly recomended it !!!! I hardly ever leave reviews, but I have to with this one. Cabin is cozy and nice, definitely needs better cleaners, and more Towels. They need to stock it better with the basic necessities. We had to go out and by dish soap and trash bags. My family and I were really excited for our stay, but by the second day we had ants all over our food in the kitchen and had to throw a lot away and Just put the rest away and then we cleaned really well. Thought that would help, but it didn’t. My frustration with this whole issue that i concerned my issues and they wanted proof of ants so I sent it and still no word back. Not shocked! We loved our stay at this cabin! Spacious enough for two families and we enjoyed the fact that the cabin had bikes and sleds for the kids. Clean and very well kept. We will definitely be staying here again! Absolutely gorgeous! I would highly recommend this cabin to anyone. I would give this 10 stars! Everything from the comfortable beds and furniture to the utensils (including BBQ utensils). This cabin has it all. They went above and beyond to accommodate us in every way. Thank you for sharing your beautiful cabin with our family.